The second was the increasing amount of twitspam I was seeing, nearly all of it misleading, much of it downright dishonest. I don't tweet false or spammy information, I don't want to read it, and I don't want to be associated with those who produce it. So maybe I need to rethink my policy on following, I thought. More quality, less quantity. And that got me thinking about the relationship between the number of Twitter followers one has and the amount of blog or site traffic Twitter drives. Does more followers mean more traffic? Clearly, the relationship between followers and traffic is anything but linear. This is also apparent from looking at the ratio of followers to visitors on a monthly basis—the number of Twitter-driven visits over the the average number of Twitter followers for that month. 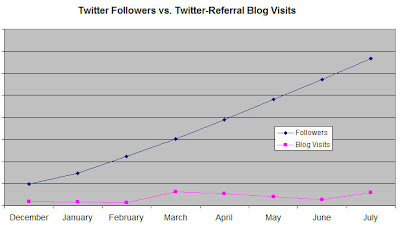 On average, the Twitter ratio was about 10%, e.g., having 1,000 followers would produce 100 blog visits. (Keep in mind this is as measured by Google Analytics, so the figures here likely understate reality to some degree.) But the range was considerable, from less than 5% to more than 20%. Conclusion: while, in general, more followers will mean more traffic, the relationship is weak and non-linear, as there are many other factors at play. Elements such as blog post topics (not surprisingly, posts about Twitter tend to draw well on Twitter), post quality, people mentioned in your posts, who you ask to retweet you, who actually does tweet or retweet your links, how many followers those people have, and time of day you tweet all have an impact on the amount of traffic Twitter will refer. Collectively, the effect of these other elements is at least as important as raw number of followers. In short, either a "QualTweeps" or "QuanTweeps" strategy can generate reasonable amounts of Twitter traffic. But it's not rude to follow selectively, and a somewhat balanced quality-vs.-quantity strategy is likely to produce better results than a blinkered focus on simply attracting more and more followers. I'm jut wondering how to implement your tactics exactly in a methodical way without spending too much time building the nest? You can use something like TweetLater (http://www.tweetlater.com/) to consolidate and partially automate your tweeting, but honestly this doesn't take that much time. I'm not sure who first described social media as a stream, but it's a great analogy. You can't possible capture all the water in a stream, but you can dip your toe in every now and then. I check in on my Twitter account a few times each day, add things, read things, and retweet useful information I see (as well as responding to anything @TomPick of course). I don't get concerned with seeing everything in my Twitterstream because it wouldn't be possible. And really isn't necessary. I like to manage the strategy what you guided here.And marketing tool will be managed to gain the social network too through the twitter etc., keep sharing.